More Demographics – Who played the most courses? 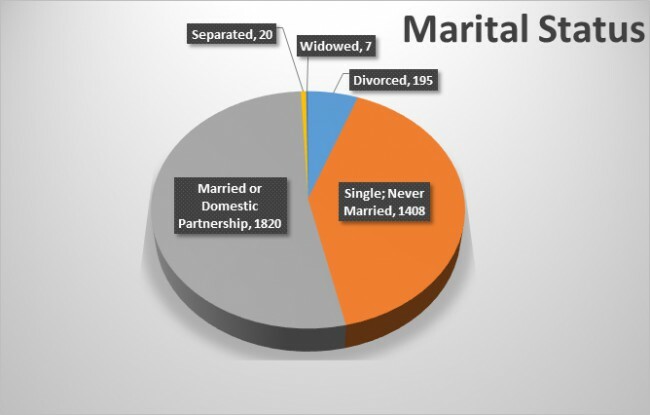 According to several sources, the marriage rate among all adults in the U.S. hovers around 50%, so these numbers show that we are close to the national average. With majority of us self-identifying as Intermediate golfers, it’s important to point out that the requirements for divisions are not uniform across the sport. Locally, most people who sign up for a tournament play in higher divisions than at major tournaments. For example, if someone’s PDGA rating approaches 900, they usually play in the Advanced division, and as their rating climbs past 900, there is a good chance they’ll play in the Open (Pro) division. I see that happen a lot. Using the PDGA standard for ratings, the same person could play in Intermediate all the way up to a 935 rating. This isn’t a commentary about which division people should sign up for with certain PDGA rating, it is just a possible explanation for the survey results. 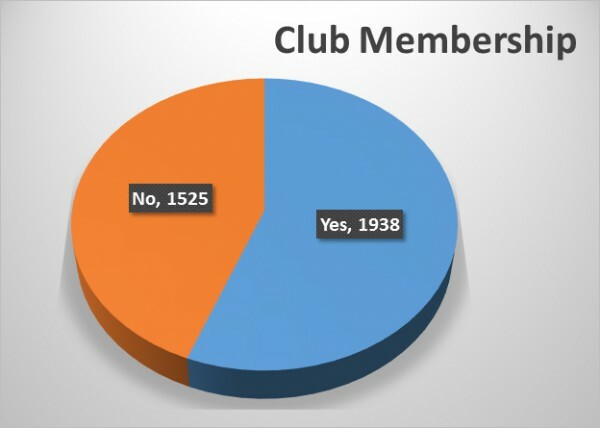 One other statistic that may shed light on the number of Intermediate players is the fact that less than half of us indicated that our PDGA membership is either current, or will be for 2016. 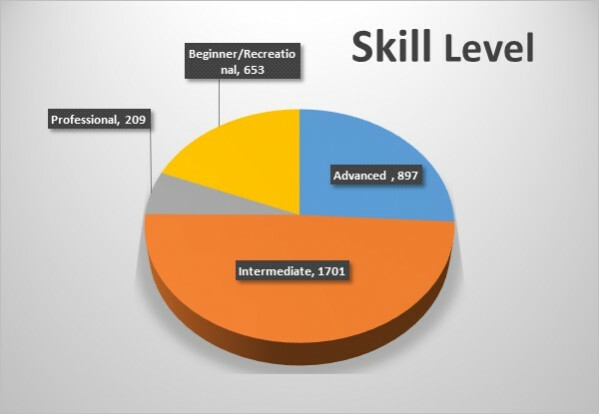 That means more than half of us simply believe that our skill level is in the Intermediate range, without the benefit of having an official rating. 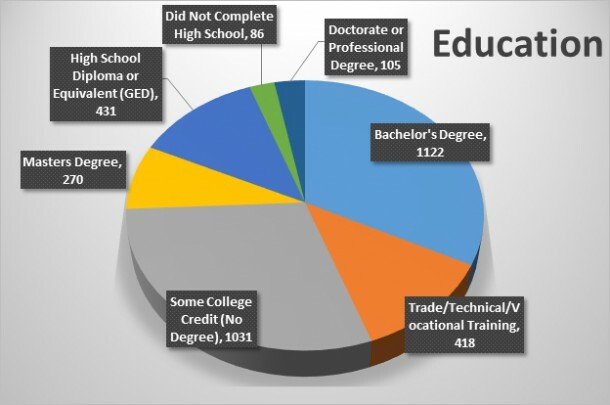 Keeping in mind that approximately 8% of us aren’t old enough to have finished college, our degree achievement numbers are slightly higher than the national average. For example, nationally (in the U.S.) 32% of the population over 25 has a Bachelor’s Degree. In the disc golf community, 36% of us have a Bachelor’s. (I deducted the approximate number of respondents who are under 25). To me, one of the big benefits of playing disc golf is the social aspect of the sport. Being part of a club helps me realize those benefits. Apparently, most of us enjoy the camaraderie that comes with being part of a group, because well over half of us currently belong to a club. More of us belong to a club than belong to the PDGA. We’ll explore some of the reasons why people do, or do not, belong to the PDGA in another post. Things are looking good for disc golfers on the employment front. Only a tiny percent of us are looking for work. 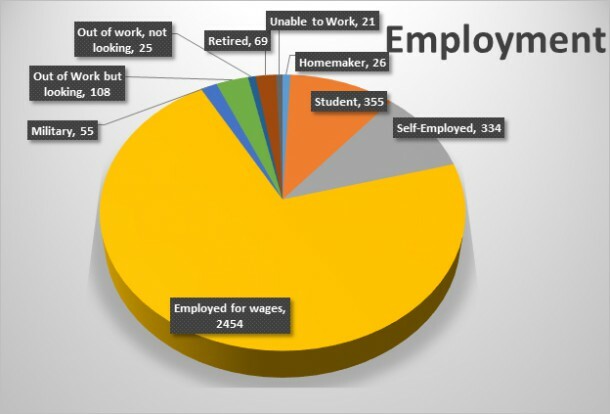 The rest of us are employed, retired, and either can’t or don’t need to work. Shout out to our military brothers and sisters who share our sport! Infinite Discs has shipped product the people overseas in the service. We’re glad to help keep you huckin’! A fun part of this sport is playing a variety of courses. Over half of us have between 1-3 courses within a 10-mile radius of our house. A small group of us have to travel more than 10 miles to get to the closest one. An even smaller group (171), but much luckier, has 10+ courses within 10 miles! However, I think this number might be slightly off. 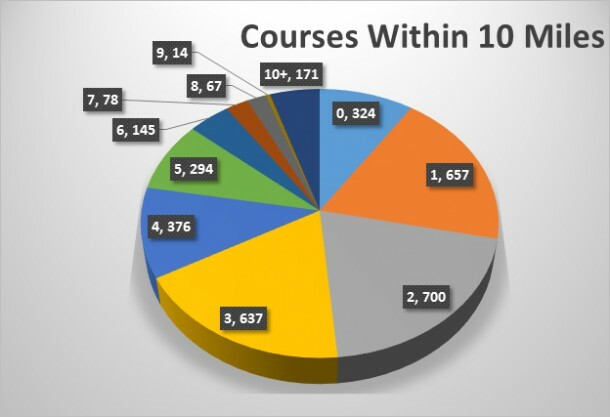 When I first looked at that survey result, I wanted to find out where these places are that have so many courses. I figured there would be a couple of locations in Michigan, Texas, and a few other states that were flush with places to play. After cross referencing the question with the location of the participant, I found that there are 25 states and one other country that allegedly have that wonderful disc golf density. I’m skeptical as to that number, too, since one of the states is Utah. I live in Utah and I know for a fact there aren’t ANY points that have 10 or more permanent courses within 10 miles. Perhaps people’s distance estimating skills are to blame? 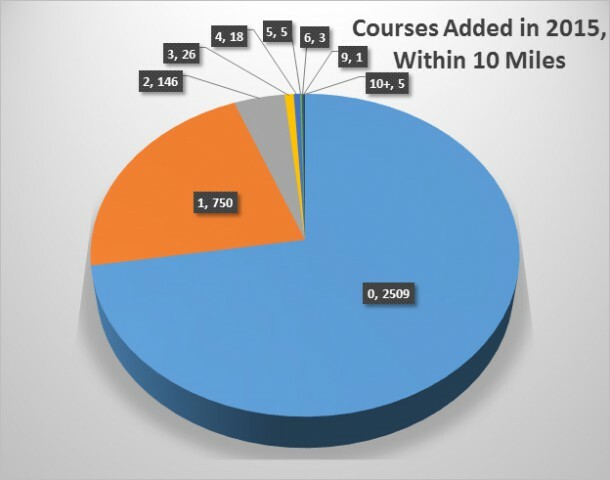 I’d like to see people comment about specific locations that really have 10+ courses in a 10-mile radius. You don’t have to list the courses, just the location. Let’s see how many there really are. Also, a little more than a fourth of us saw at least one new course installed within 10 miles. Since nearly all of us (95%) live in places that have 9 or fewer courses within a 10-mile radius, it is apparent by our responses that we like to travel to play other courses. 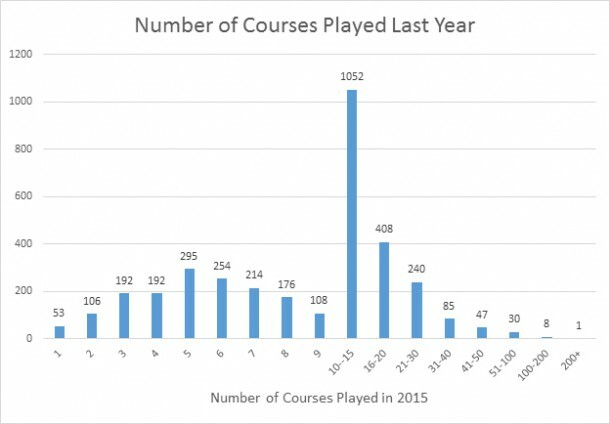 Over half of us played 10 or more different courses last year. The largest group was the 10-15 range, with nearly a third of us falling into that category. Happily, everyone who responded to the survey played at least one course last year! One adventurous soul indicated he played 200+ courses last year. Curious and insanely jealous, I had to investigate this number to learn more about his other responses. The follow-up questions asked about how often we played during certain times of the year and his responses to these questions led me to believe the 200+ answer was a mistake. Or maybe a fantasy. Still, eight people indicated they played between 100-200 courses. Even if they are all on the low end of that scale, it sure sounds awesome! For the next blog we’ll look at our responses to questions about tournaments. Fun information. I think one of the reasons so many people identify as intermediate is because we’ve all played with true beginners that can’t even throw 100 feet. Compared with these guys, the guy who has played a dozen times and can throw 200 feet considers himself intermediate. For the average recreational disc golfer, as in the guy that shows up to the course and plays with buddies, but never practices and never plays in tournaments, most intermediate players by PDGA standards would be considered advanced players. The terminology for intermediate, advanced and recreational are all relative. Greg Hosfeld (Florida)claims to have played the most courses. I showed him around the course in McMinnville Oregon. I believe he did walk throughs on more courses than anyone. It depends on your definition of playing. Greg drove the holes but never putted out. As far as Montana players they are fiercely independent and rarely join groups, which is why I didn’t join PDGA until it actually saved me money in tournaments. The average PDGA rating consistently hovers around 910, right in the Intermediate range which also has the most players.